Your most fundamental value is your expertise. It's the lifeblood of your business and the foundation of your marketing. If you're an author, speaker, consultant, or expert like an attorney or physician, you directly share your expertise in your work. If you have a tangible product, your expertise is expressed in the content you develop to market and support the product. It's your web site, FAQs, help and support forums, sales brochures, presentations, white papers, webinars, videos, ads, commercials, etc. This Content is used in all our marketing campaigns. You'll see it in the various services we provide as it's what prospects look for on search engines, what they learn about you once they find you, and how they make that critical buying decision. The Revenue Typhoon system is founded on valuing, packaging, and communicating your content in the right form ... at the right time ... in the right channel. We can even turn your Content into a product itself. Read below to learn about creating a line of information products. When developing content, we recommend that you start with an ebook. While you may not consider yourself a writer, you already are. You're an author if you have a blog, comment in industry forums, write reports, analyses, articles or briefs, or speak to prospects, partners, or groups. You're certainly an expert in your company, product, or specialty. The question isn't if you're a writer ... It's whether you should do the writing if you don't have a lot of original content. Writing is time consuming. In most cases we recommend outsourcing. It's typically far more cost-effective. Your time is better spent editing and using our system to market. Revenue Typhoon helps you not just publish your book, but become an Amazon #1 Bestseller. And that truly makes you an Instant Expert. You gain invaluable credibility in the media and the marketplace. Your book kickstarts your marketing. Requests for speaking and interviews with TV, magazines, and radio start coming to you and not the other way around. You're an Instant Expert and thus compelling to prospects who don't know you. That results in strong conversion to leads. Your book enables valuable content for offers and lead and sales conversion, such as an exclusive chapter, audio or video reading, webinar discussion, or other supplemental material. You own the ultimate sales calling card. Nothing beats meeting a lead in your office surrounded by your books ... or visiting a prospect and handing him your hardcopy book in person! 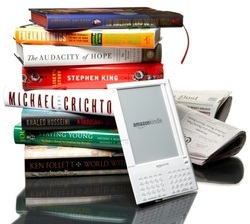 Your ebook and hardcopy book both become new revenue streams. Book are the first steps of the Product Pyramid, which is the secret to generating revenues. Each step captures a natural customer buying decision point with a discrete product, offer, and marketing and sales process. It engages and builds customer interest and their level of financial commitment. The Product Pyramid delivers increasing sales with products at increasing price points from a free offer like an ebook to a paid ebook to a hardcopy book to webinars, subscriptions, seminars, audio series, training, video series, consulting, conferences, and masterminds.